Look for God’s message in everything !!! Do you feel that you are in a complicated situation today when nothing seems to be going right for you? Are you bewildered or baffled by what is happening around you? Relax! God always has our well being in mind. 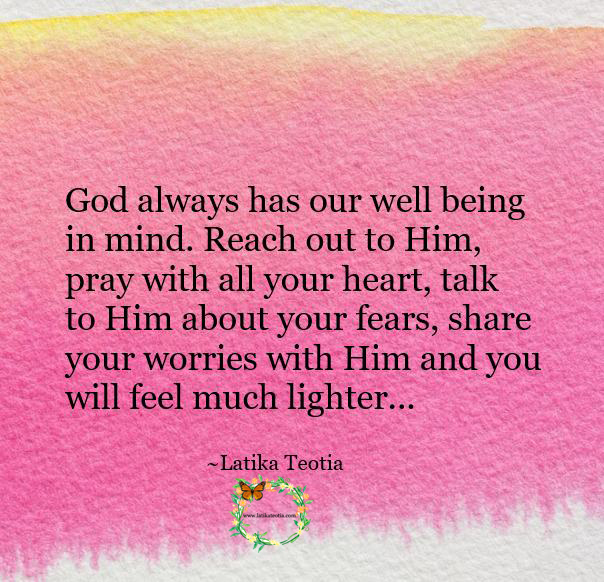 Reach out to Him, pray with all your heart, talk to Him about your fears, share your worries with Him and you will feel much lighter. You may even see the purpose of your present situation. A lady was having her breakfast, her 7 year old daughter, who was in a playful mood, accidentally dropped coffee on her. She yelled at her and had to go and change her clothes. When she came down, she found her child crying hysterically. It took a lot of time to pacify her and in the commotion the girl missed her school bus. She had to go and drop her to the school knowing full well that she was going to be late to office and would get hardly any time to prepare for an important presentation that she had to give later in the day. She cursed her fate, looked up to Heaven and muttered, “O God why me? Why did this happen on such an important day?” After dropping her daughter at her school she found that her office block, which was in a high rise building, had caught fire. The fire which had started two floors below had quickly spread to the rest of the floors and her colleagues were trapped in the building. Had she reached in time she too would have been one of them. Delay in reaching office had, in fact, saved her!